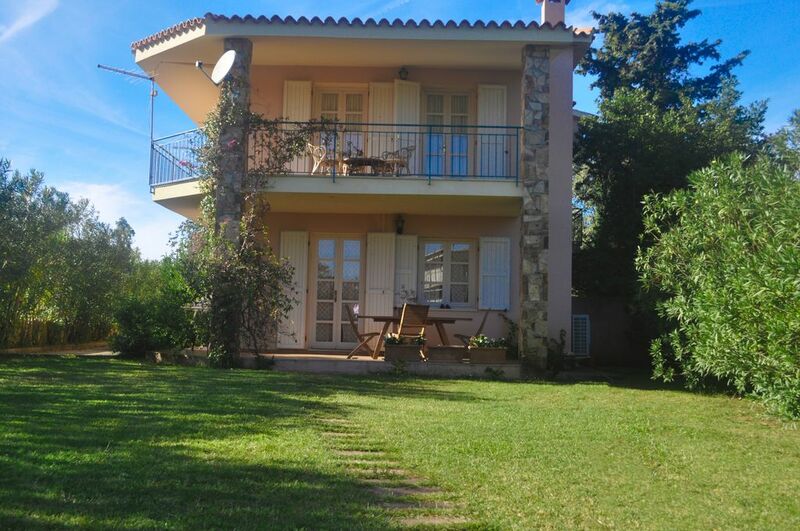 Semi-detached villa situated 150 metres far from the beach and 400 metres from the centre of the village. All the main facilities (bank, pharmacy, bars, restaurants) easily and quickly reachable (not more than 800 metres far). The villa is on two floors. It has a wide living room, 2 bedrooms, 2 bathrooms ( 1 service bathroom and 1 full bathroom), and two living verandas (one on the first floor, one on the ground floor). Ground floor: Wide living room + Kitchen + 1 service bathroom + living veranda. It has a nice large garden(200 m2) and private car parking. there is a washing machine, barbeque, TV,shower outside , Air conditioning,dishwasher. House is plain, but clean and comfortable. (One issue - you need a proper, bigger kettle and a plug socket in the kitchen for it - the one socket in kitchen is used for microwave and couldn’t be removed. It’s not safe around children to boil water on a low table in living room.) The beach is wonderful and moments away. We visited end of October at half term and (despite assurances that most places would be open) all but one of the beach bars and restaurants were closed for the season. A pleasant stay, thank you. This clean and well kept villa was the perfect spot for our Budoni vacation. A short walk to the beach and restaurants. The beautiful garden and terrace was wonderful for our 3 year old. There was a washing machine as well, an added bonus when traveling with young children. Pasquale was helpful and professional. Overall a wonderful experience! We stayed for a week in Villa Rosa in july .It is very close to the beach and centrally located in a Budoni town where the people are friendly and gracious in a beautiful part of Sardinia. The Villa was exactly as described, is very confortable, well equiped and thought. Everything is perfect and you feel just like home and It was scrupulously clean. Pasquale is very helpful, answering your questions and giving you advice and tips. The Patios covered outside are very relaxing and nice to have a drink of red wine on the sunset. there is air conditioning in every room. the garden is large and well cared and it was much appreciated by my children. Budoni beach is amazing and safe for the children. A huge thank you for everything, we will certainly see you again !! A nicely appointed property very convenient for the beach and restaurant and a short walk from the town. Accurately described and well maintained - the manager Pasquale is very efficient,organised and speaks good english - very helpful and professional - highly recommended. The property was exactly as described. Lovely spacious open plan ground floor leading onto a beautiful unoverlooked garden and sun terrace. The kitchen is fully equipped for self catering. Upstairs there are 2 bedrooms, a bathroom and a very large sun balcony. The family who own the villa were very helpful and met us on arrival at Budoni to show us round the villa. Cows were lowing in the field that backs onto the garden and it really felt like we'd escaped to the country. Budoni itself is beautiful, with a vast undeveloped beach backed by mountains and featuring a main road with two mini-marts and numerous bars, restaurants and shops. We visited Sardina in the English school easter holidays and it was great to find that Budoni is not overrun by Brits abroad and the waiters in the restaurants don't speak english. A true sense of travel! The villa is in an ideal location, in a very quiet road, 2 minutes walk from the beach and approx 10 mins from the main road restaurants. Travelling as a family of 5 (two adults and children aged 6, 8 & 9), we had a wonderful holiday in sardinia and hope to return. Nice Beach House, Just As Advertised! Pleasant beach house, ideal for families with small children. With only 150 m to walk to the beach, this makes coming and going with a small child quite easy. The contact person, Pasquale, is super friendly and super helpful. The property is as described and the photographs are accurate, so there are no surprises. The house is away from the street, so you don't hear the traffic. The supermarket is only a 10 minute walk away, therefore our car was optional during our stay. The yard is pretty and the oleander are beautiful! Budoni is a seaside resort on the north-eastern part of the island, situated between two municipalities; San Teodoro to the north and Posada to the south. It's located on Sardinia's main road n.125 that follows the eastern coastline from Cagliari to Olbia. It includes 18 km. of coastline that rise from the Tyrrhenian Sea, offering Budoni marvellous landscapes and sandy beaches and surrounding it by rocky walls. The nearest beach is only 300 meters from the village. However, Budoni doesn't only mean the sea; the village is situated on a flat area but the rest of the territory is prevalently hilly and only slightly inhabited. There are plenty of folkloric events linked to the life and the traditions of these small settlements surrounding Budoni.